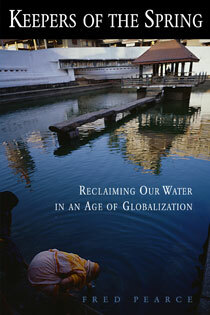 Water has long been the object of political ambition and conflict. Recent history is full of leaders who tried to harness water to realize national dreams. Yet the people who most need water-farmers, rural villages, impoverished communities-are too often left, paradoxically, with desiccated fields, unfulfilled promises, and refugee status. It doesn't have to be this way, according to Fred Pearce. A veteran science news correspondent, Pearce has for over fifteen years chronicled the development of large-scale water projects like China's vast Three Gorges dam and India's Sardar Sarovar. But, as he and numerous other authors have pointed out, far from solving our water problems, these industrial scale projects, and others now in the planning, are bringing us to the brink of a global water crisis. Pearce decided there had to be a better way. To find it, he traveled the globe in search of alternatives to mega-engineering projects. In Keepers of the Spring, he brings back intriguing stories from people like Yannis Mitsis, an ethnic Greek Cypriot, who is the last in his line to know the ways and whereabouts of a network of underground tunnels that have for centuries delivered to farming communities the water they need to survive on an arid landscape. He recounts the inspiring experiences of small-scale water stewards like Kenyan Jane Ngei, who reclaimed for her people a land abandoned by her government as a wasteland. And he tells of many others who are developing new techniques and rediscovering ancient ones to capture water for themselves. In so doing, Pearce documents that these "keepers" are not merely isolated examples, but collectively constitute an entire alternative tradition of working with natural flows rather than trying to reengineer nature to provide water for human needs. The solution to our water problems, he finds, may not lie in new technologies-though they will play a role-but in recovering ancient traditions, using water more efficiently, and better understanding local hydrology. Are these approaches adequate to serve the world's growing populations? The answer remains unclear. But we ignore them at our own peril. Chapter 3. Egypt's Source of Everlasting Prosperity? Chapter 10. The Last of a Dying Breed?